If you’re looking for a beautiful and long-lasting patio space, O’Grady’s Landscape has the solution. We specialize in the design and installation of high quality paver patios, providing homeowners in Great Falls, VA with entirely custom products. Our landscapers have extensive experience in all aspects of hardscaping, and our customer support service is unparalleled in the Great Falls area. We want to help you enjoy your outdoor space to the fullest—whether that means plenty of space for outdoor entertaining or a cozy nook to get away and relax. We believe our paver patios are just the thing to make that happen, and we want to help you create the perfect design. Get an estimate on your project today—contact us online or by phone at 703-533-5001! Why Choose Paving Stones for Your Patio Project? At O’Grady’s Landscape, we want to make sure your paver patio is perfectly tailored to your needs and the surrounding landscape in the Great Falls area. We offer a range of materials to help you accomplish your unique goals. Brick pavers can help you create a patio with a classic look and one-of-a-kind character. They’re available in multiple shapes, sizes, colors, and finishes, so it’s easy to customize them around your needs. However, it’s important to consider your budget—brick pavers can take a while to install, making initial costs higher. Like brick, stone is an easy choice if you’re going for a classic look—but it can also work well in a more contemporary design. There are various different stones to choose from, with different color variations based on the type; flagstone is especially popular for paver patio designs in the Great Falls, VA area. Stone pavers can be cut for a structured design, or uncut to produce a random, irregular style. Concrete pavers are an excellence choice for a patio in color, and the installation cost is much lower. They can be easily customized in terms of color and finish, and they’re also known to have a long lifespan. Need help making a decision? No problem! Just ask your landscaper for assistance. 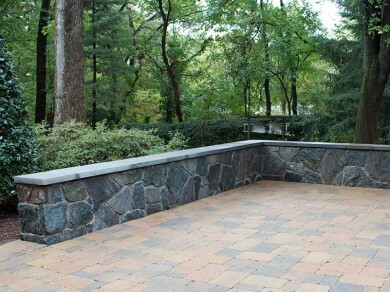 Why Choose O’Grady’s Landscape for Paver Patios in Great Falls, VA? Your patio is an important part of your landscape design. Don’t settle for second-rate when you can have the very best. Choose O’Grady’s Landscape for your paver patio project in Great Falls, VA—give us a call at 703-533-5001 to request a consultation!